Welcome to this week's edition of Finance Fridays. Last week we were looking at the carrier bag charge that was introduced in England on Monday. For this week we're keeping the eco and monetary theme and looking at solar panel costs. The big news at the moment is that the Government is planning to cut the subsidy rate it pays from January next year. So let's have a look at what is involved in installing solar panels. Many people think that a set of solar panels on their roof will generate electricity, heat their water and keep the house warm. This is not the case as there are two type of solar panels which do different things. The first is solar thermal panels which can be used to heat water and cut down on heating bills depending on your central heating system. The second is the more common solar panel electricity systems also known as photovoltaic solar panels or solar pv. Modern solar panels work through the amount of daylight that can be captured rather than just the sun's rays. The essential part is that they need to be installed on roofs which are south facing and tilted at around 30 degrees. Purely south facing roofs are best but they will still work on south-east or south-western facing roofs but the panels won't generate so much power. If your roof is in shade for most of the day it won't be suitable either as the panels really need daylight between 10am and 4pm to work. Remember as well that solar panels are heavy so your roof will need to be strong enough in order to house them. I expect most of us have had a phone call or a leaflet through our door about free solar panels. So why pay when you can have them installed for free? The simple reason is the Feed-in Tariff (FIT) which allows home owners to receive payments for any unused energy that they don't use. With free solar panels the company that installs the panels receive this payment instead. Effectively over time this will pay for the cost of the panels and keep making money. If you buy your own panels you are in control of how long you want them up for. If you move house it be possible to take them with you. However it could be costly to make the repairs to your roof. You may want to remove them even just temporarily for house improvements such as a loft extension. You will though be responsible for insurance costs (essential for potential storm damage) and any maintenance. Most systems are fairly reliable but usually a key part known as the inverter will need replacing and this currently costs around £800. With free solar panels the companies 'rent your roof'. You sign a contract to lease your roof for around 20-25 years and in return receive free solar panels. The installation company will pay for any insurance and maintenance costs. While your electricity bills will be lower you won't be able to make any further money through the FIT. 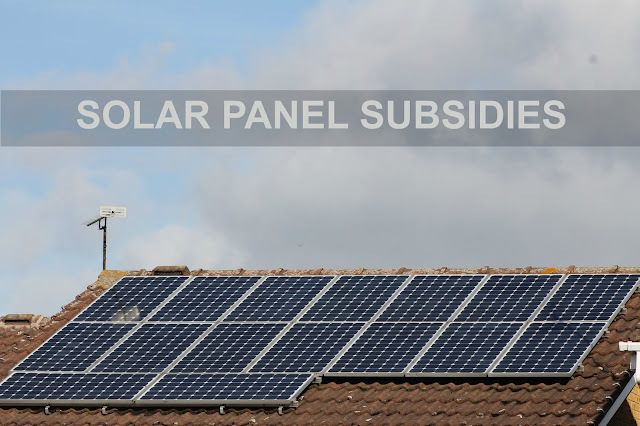 As the subsidies are being reduced some solar panels installers are now requesting that with free solar panels the customers also have to pay for a percentage of the energy they used. Be warned about these contracts as they usually go with the house and not you. Therefore if you move you will need the new home owner to agree to taking on the solar panels. In order to encourage people to install solar panels the government introduced subsidies for renewable energy systems. This is known as the Feed-in Tariff (FIT). In England, Scotland and Wales payments are made for the total amount of energy generated and also any unused energy that is sold back to the energy companies. Anyone who already has solar panels and has registered for the scheme has their subsidy rate guaranteed for 20 years and it will also rise with inflation. However from January 2016 these subsidies will be substantially cut for any new installations. While you will still save on your electricity bills any extra income be much lower. Why is the subsidy being cut? For new installations the current FIT for the most energy efficient homes is 12.47 pence per kWh and from January 2016 it is proposed that this will drop to 1.63 pence per kWh. When it was first introduced in 2010 the rate was 41.3 pence per kWh. The government has stated that the scheme needs to be economically viable. At the moment the scheme is financed through green levies on consumer energy bills. If the bills are to be reduced the subsidies need to be reduced. It has been argued that some consumers are paying for solar panels which they can't have installed themselves because they can't afford to buy them, no free solar panel schemes are in their area, they live in flats, have a north facing roof only or their south facing roof is shaded due to a tall building. In the past week alone two solar panel companies have collapsed citing a lack of confidence in the future of the UK solar panel industry. It has been estimated that up to 20,000 jobs could lost due to the subsidy cuts. Other charitable bodies and council schemes have said they will have to close next year if the subsidy cut is implemented. For home owners who buy their own panels the pay back period goes from an average of 10 years to 25 years. For many people having solar panels installed will be based on purely environmental reasons rather than financial ones. The simple advice is that if you have been thinking of having solar panels installed do it before the subsidy is cut. If you're after free solar panels you may find it harder to find a provider and you may end up paying a higher percentage just to use the energy the solar panels on top of your roof has generated. As last week's topic was all about the carrier bag charge Kara showed us a way to beat the plastic bags through the use of reusable trolley bags. If you want to join in with this week's Finance Fridays then add your link to the linky below. Any post concerning financial matters is allowed. Full details here. It doesn't have to be published today as you have until 23.55 on Tuesday 13th October 2015 to join in. Grab my badge below for your blog post. A few households on my street have had solar panels, so I was surprised to read that there is a lack of confidence in the UK solar panel industry when what I see around me is a visible take up. I guess we can watch and see what happens for the future of solar panels in the UK. I'd like to have them but I'm concerned about the pay back time even though we intend to be in this house for more than 10 years. I have solar panels, they help reduce my bill which means even though I moved to a house twice as big as my last one, my bills are no higher. They were already fitted when I moved in but the house is a new build and the whole street has them. Thank you for this, super useful as my father has been talking about these solar panels because a few people on his road got them installed. Going to send him this to read. I can see how these could be a great investment. The environmental aspect is very appealing too. Our roof is facing the wrong direction so we are not in a position to consider them. My in laws looked into it but the initial outlay was much too expensive. It really is a shame that there is not a greater financial incentive to encourage people to move towards greener energy where possible. It seems ridiculous that the subsidy is being cut - thanks you for explaining this issue so well. I am still not convinced they are as good as they sound, it is a great post which explains a lot, I just can't imagine they make all that difference.